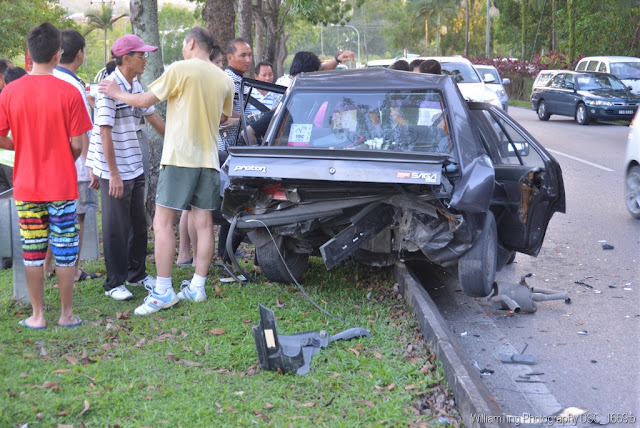 16-Dec-2012 5:30PM: I was passing by Taman Awan on the way to Merdeka Mall and saw this accident involving a Proton Saga and a Brunei registered Lexus LS300. I think it took the ambulances at least half an hour to arrive on site. 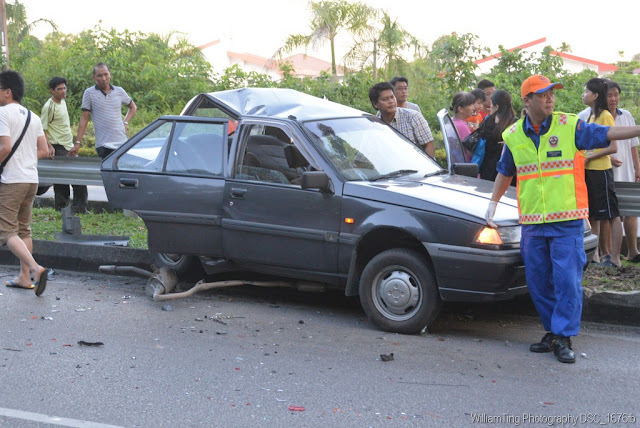 Upon impact, the Proton was flung to the side of the road, over the road divider and turned 360 degree! I was told that the Proton was parked at the road side. It seems to supported such a theory because the hazard light was switched on and the handbrake was engaged. ... the Proton was compressed to half of it length! Fortunately there was no passenger at the back seat! The young lady driver was quite seriously injured as I saw blood from her mouth. I hope that her spine is ok. She seems to drift in and out of consciousness and wasn't moving. A young child was flung out of the car and landed on the grass at the road divider. 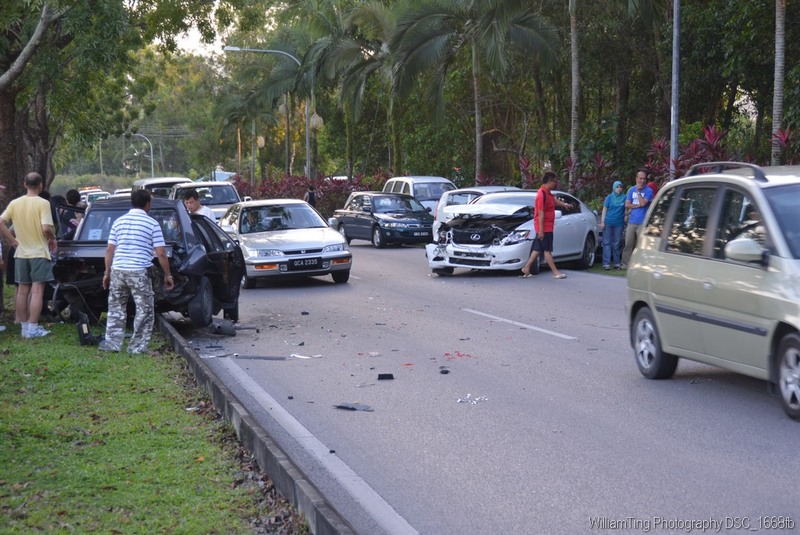 The driver of the Bruneian car wasn't seem to be seriously injured. I saw just some scratches on his arms and appeared to be shaken. A serious accident happened at the same spot. A lady driver ramp into one of the trees and died on the spot. I think that was last year. Generally, try not to break down in the middle of a road when you own a car that is literally the same color as the road itself. Makes a lot of sense. It becomes a camouflage. That is a really scary accident. The Proton obviously much of the impact. I do hope the woman has already recovered from the accident. I recommend that she seek help from an attorney to assist her with her insurance and if she wants to file a case against the one who bumped into her. It seems that it wasn’t the first time that an accident occurred in that area. Local authorities must pay their attention there, so no incidents like this will be reduced. The owner of the Proton must've been devastated because it badly needed repairs. I just hope that the person liable on the accident helped the owner for all the damage costs. No, this is an accident prompt area. The car needs to be written off! Mike, Proton is like a tin can! Don't think the safety features are any good. Whoa, the Proton was compressed to half! That sure is dangerous, even deadly if the impact affected her spine and head. It truly is better to have a car that would somehow protect you during accidents. I hope the driver of the Lexus was held liable for the injured driver’s needs. Guadalupe, you are right. I believe the Proton driver was seriously hurt as I saw blood from her mouth! I just wish that our people here are well verse in their right to call a lawyer to fight for their 3rd party claim. Why was the car parked in the middle of the road in first place? To offload passengers? To use the phone? Broken down? Everyone should know that putting yourself in the middle of the road is extremely dangerous, not think lightly of it like most people around these parts do, especially when your car is the same colour of the road, like first Sad said. You cannot expect people to see you as because it is a two lane road, changing lanes is allowed and if you suddenly change into the lane that was blocked and did not see it because you are behind another tall vehicle, this will happen. Carry a strobe light in your car, and if you do break down in the middle, put the strobe light where everyone can see it so they have ample warning.